Club Results-Pro-Am - Murray River Golf Course Cohuna. Golf Club Cohuna. 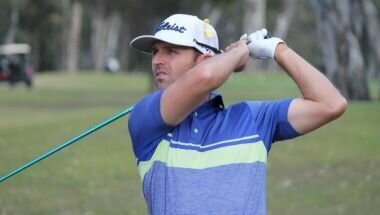 Teeing up at the Stuart Appleby Pro-Am for the first time, West Australian Rick Kulacz got off to a slow start before finding the course to his liking on he back 9. Making the turn at 1 under the card, Kulacz made birdies at the 10th,and 12 holes before driving the green on the par 4 – 13th and rolling in a six foot eagle putt to move to 5 under the card. “On the 13th I hit a good five but it got a huge bounce and ended just six feet from the pin,” said Kulacz. A birdie on the par 5 16th saw Kulacz take a two shot lead over Lynch and Kelly, however he gave it straight back with a bogey on the 17th. A round of 5 under 67 provided Kulacz with a one shot victory. “This is my first time here and I must say I’m really impressed, I cannot believe you only have one person on the course staff here. A big thankyou to Ross he does an amazing job” added Kulacz. About the Ladbrokes PGA Pro-Am Series: The Ladbrokes PGA Pro-Am Series is a Professional golf circuit managed by the PGA of Australia. The Ladbrokes PGA Pro-Am Series consists of approximately 140 tournaments across Australia and the South Pacific with close to $2.7million in prize money on offer each year.